It's very simple, at times perhaps too much. But with its difficult story, the latest Iraqi stadium is still impressive. Especially the facades, adorned by hypnotising pattern all around! Decision to build a new stadium north of Najaf was made in 2010. It was part of the nationwide post-war infrastructure rebuilding programme. As was quite common, American company was awarded the design contract for Najaf's venue. The interesting concept was drawn by 360 Architecture (later acquired by HOK). Initial vision suggested that both main and training stadium would have a running track – as is customary in Iraq – but later a shift to football-specific mode was made. 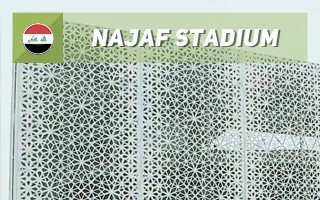 You may notice that Al Najaf FC received a very 'American stadium' indeed. The seating layout resembles that known from MLS with smaller lower tier (with no facilities beneath, part of a sunken bowl) and a larger, steep upper tier. There also is an opening towards the city, quite frequent in US stadia, behind the southern goal. Overall the stadium was designed economically, with value-for-money much in mind. 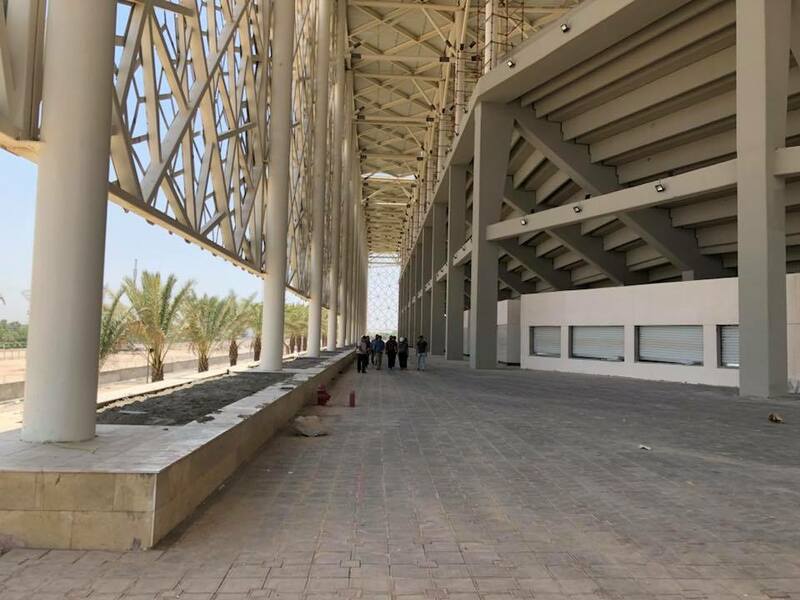 Its facilities are limited to kiosks and toilets around the perimeter with only the west stand offering 3 levels for sportsmen, maintenance, offices and hospitality. Natural ventilation and efficient protection from the sun are ensured by the stadium's graceful, openwork facades. By using simple materials (white steel) a very impressive result was achieved. Prefabs utilising traditional Islamic patterns are mounted as outer walls of the stadium, then covered with more detailed sheets to create a dynamic image of arcades inviting fans inside. A hypnotising and dynamic illumination was also designed but not created to date, due to optimisation. Stadium construction began in 2011 and was supposed to be done by 2013. However, further warfare and following economic crisis forced the sports infrastructure programme to stop. Though restarted already in 2014, according to our information, construction only gained speed in 2016 and allowed for opening in May 2018, to a packed house despite only a friendly fixture. At that point not all work was delivered, further months saw ongoing efforts to deliver less crucial elements.